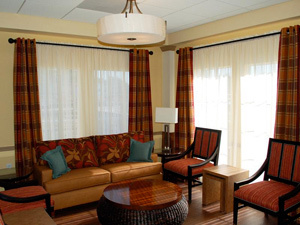 Affordable Structures is proud to offer clients the highest-quality award winning modular construction solutions. 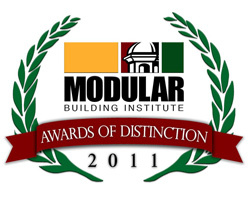 Affordable Structures was awarded Modular Building Institute’s Award of Distinction in both 2010 and 2011. The MBI Awards of Distinction contest is the commercial modular industry’s premiere awards program, offering competition in over 30 categories for MBI members: building manufacturers, dealers, and product and service providers. 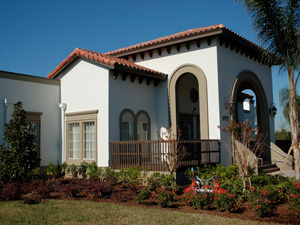 The sales center was initially manufactured in 2003 as a 10-unit custom office located in Myrtle Beach, SC. After 6 years of use, the building was disassembled including a complete site-built roof / portico element, and sent to storage. 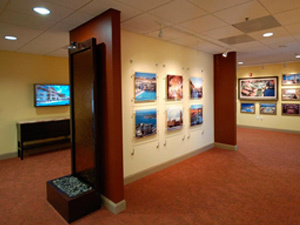 In 2009, a new development in Florida required an upgrade sales center. It was determined that 6 of the original 10 units could be relocated and used with complete renovation, with the addition of 4 new units added to the center to serve as the primary entry vestibule. The renovated building features 10 ft. tray ceilings, custom millwork, granite c-tops, and a portico entry with a four-plane clay tile roof system. This architectural detail conceals the roof mount HVAC units and extends the building height to 18 ft. above grade. The exterior wall finish is synthetic stucco with corbel elements below soffits, architectural banding, leader pipes, columns and indirect architectural lighting. Affordable Structures’ vast experience in the modular building, portable building and Green construction industry has allowed for relationships to be developed with the variety of related modular building associations listed below. Florida Educational Facilities Planners’ Association, Inc.
R & S Tavares Associates, Inc.